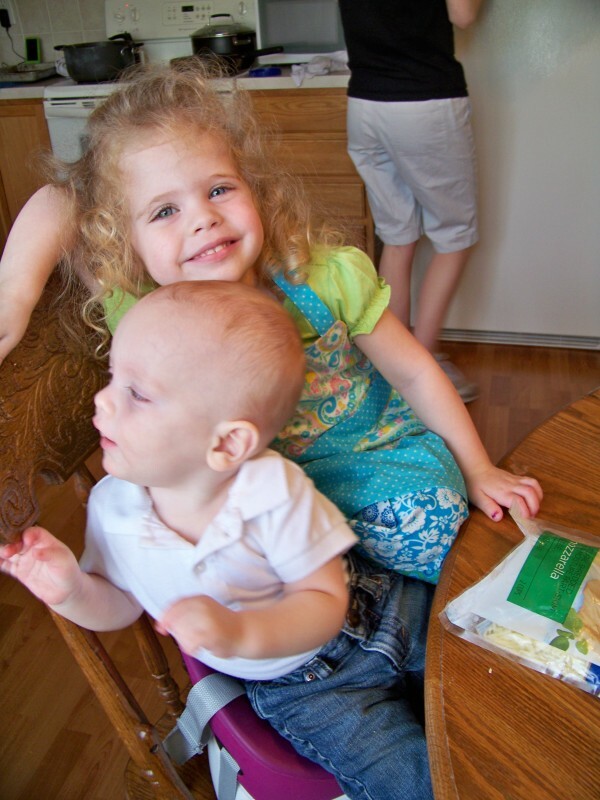 Kaitlynn (2) and Silas (10 months) both enjoyed “helping” with Freezer Cooking Day. I think they may have done more eating than helping, but that’s okay. 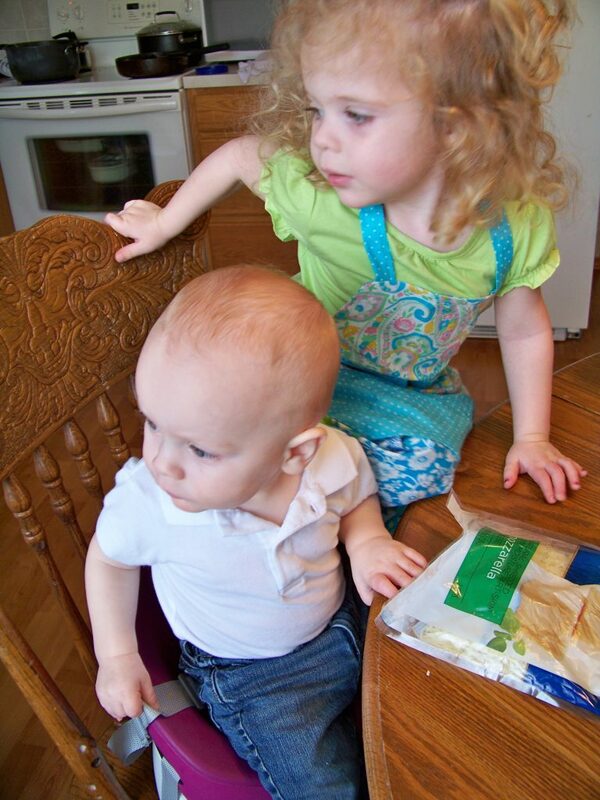 I figure if I start training them young, someday soon, they’ll be my right hand and my left hand. 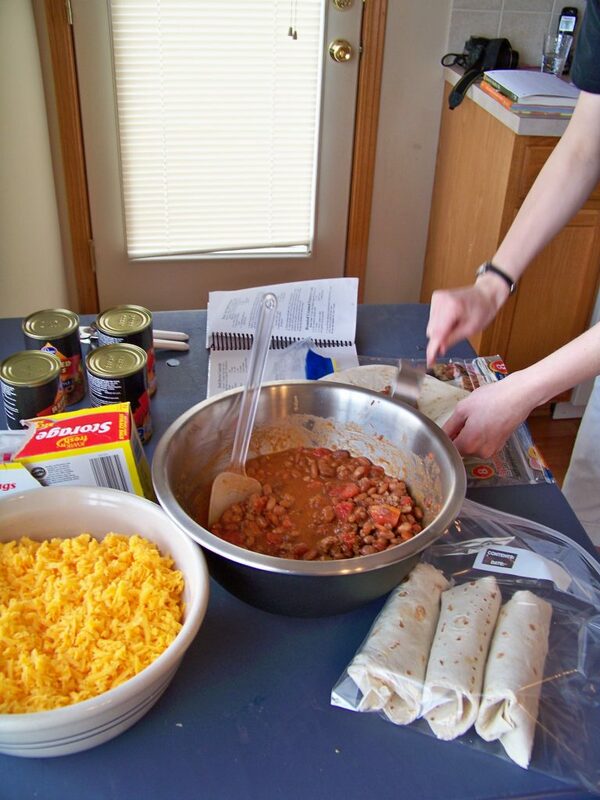 While I worked on grating the cheese, the others got busy chopping peppers, boiling noodles, browning ground beef, and Gretchen started putting together the Beef, Bean, and Tomato Burritos. 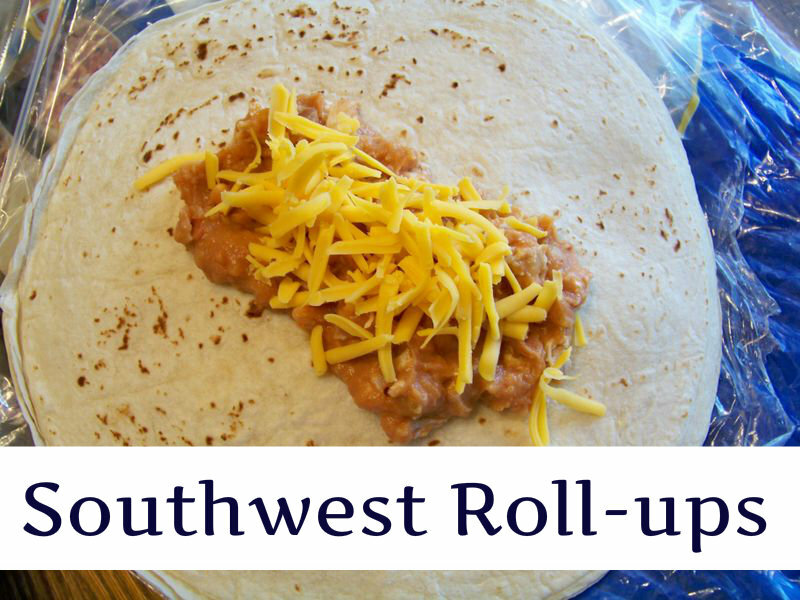 (I’d love to share that recipe with you, but she made it up on the stop–as the girls in my family are prone to do!–so I haven’t a clue what was in them aside from cheese, tomatoes, taco seasoning, beef, beans, and tomatoes rolled up in tortillas). Our kitchen is on the small side. It works for our little family of five, but it gets cramped really quickly if you add in more people. However, compared to the crackerbox kitchen we had in our little basement apartment, it seems rather spacious! I wasn’t sure how four of us were going to cook in the kitchen without bumping into each other all over the place–especially since we’re short on counter space. My sister had a brilliant idea: set up a cardtable! So we added a large amount of work space just with this simple addition to the kitchen. Someday, I’d love to have a a large kitchen with massive amounts of cupboard and countertop space. But in the mean time, a card table works great when you’re in a pinch for extra countertop space! Our Freezer Cooking Day began at 9:15 a.m. yesterday morning. I had planned a Master List of everything that needed to be done and the order it needed to be done. I also tried to equally divide the work up among those of us who were working in the kitchen. We didn’t completely follow the plan, but it was really helpful to have everything thought-through ahead of time. Remembering how we’d run out of bowls and pots and pans last time, I asked everyone to bring pots and pans and bowls. I also had everyone pitch in on bringing ingredients and that seemed to work well. The only thing I forgot to ask someone to bring? A real cheese grater. I have this little half-sized dinky one that I picked up at the store a number of months ago when my much-nicer one got rusted. Let’s just say that it was rather impractical to grate that pile of cheese blocks with my mini cheese grater. 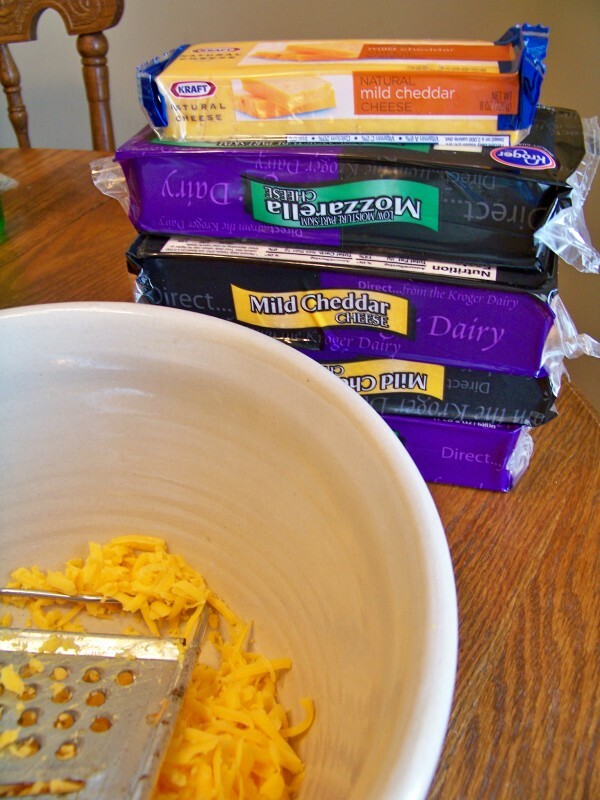 Somehow, I managed to grate them all–but it took me probably five times what it would have taken with a real grater. But I’m all about making do. Next time, though, I’m definitely investing in a better cheese grater! When I asked for ideas for using up canned biscuit dough a few days ago, I never quite expected to get over 450 responses! 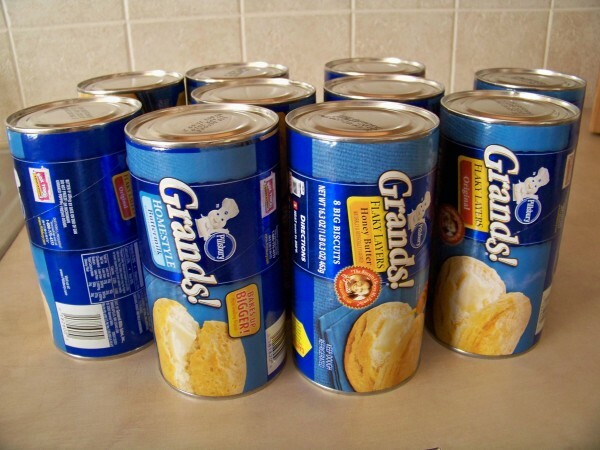 I almost wished I’d picked up more than 12 cans as now I have biscuit dough recipes running out my ears. But alas, I only had 12 cans, so I decided on making Melt In Your Mouth Coffee Cake and Monkey Muffins since I had all the ingredients on hand to make both of those. We had a dinner to attend last night so I figured those would be perfect to bring to it. 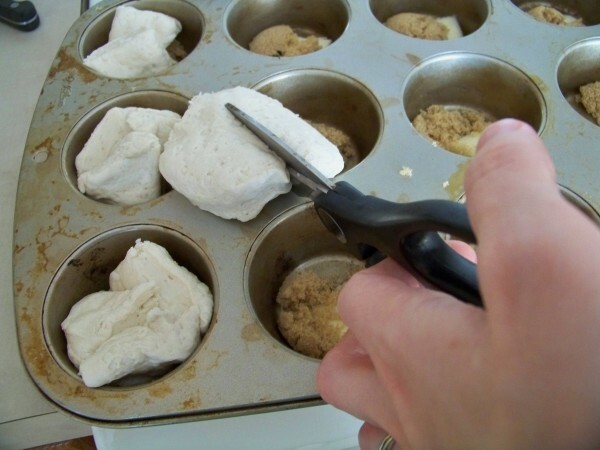 The Monkey Muffins were so easy to make–especially with my handy-dandy kitchen scissors! The Melt In Your Mouth Coffee Cake was a snap to make as well. But word to the wise: be sure to put a pan underneath your pie plates. 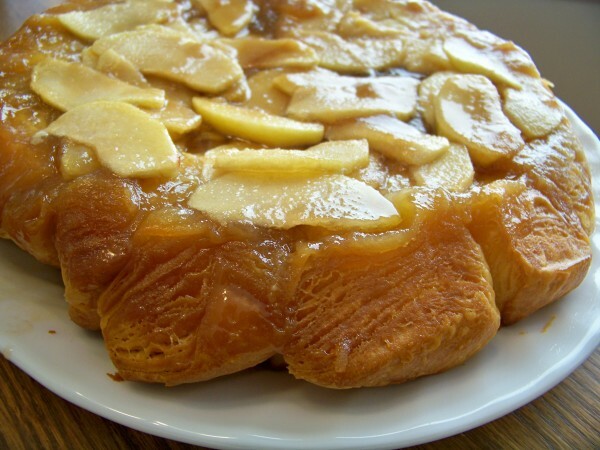 I made two of these and they leaked brown sugar goop all over the bottom of the oven. 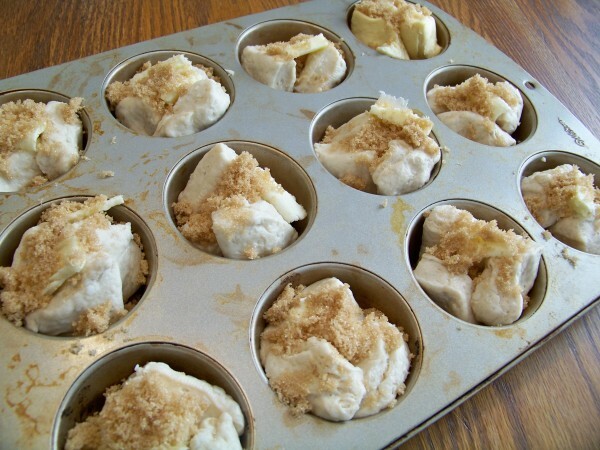 Do you know what brown sugar goop does when it leaks onto the oven floor? That’s right, it catches on fire. I wasn’t paying much attention and all of a sudden happened to notice an orange glow emanating from the oven window. The brown sugar goop was ablaze! After sequestering the children far away from the oven, I pulled the almost-baked coffee cakes out, turned off the oven, shut the oven door, and waited to make sure the fire went out. All the while, my 5-year-old daughter was hollering “There’s an e-mer-gen-ceeee! !” all throughout the house. It was a prime opportunity to reiterate what you are supposed to do when there’s a fire. The coffee cake turned out wonderfully, despite the fire. My husband called it delicious–and I was even pretty impressed that canned biscuits could turn into something so scrumptious. Now I just have to figure out how to get my oven to stop stinking and smoking! Sound familiar? Well, today we’re going to dispel the myth. You can practice bulk cooking even if you have small storage space. Really and truly. Want to see how? For the record, that is a 10 cubic foot freezer into which I placed 20+ meals and still had extra space. The meals were varied, from casseroles to sauces to chili to marinated meats. Let me explain in more detail how you can make this work for you. The first time I attempted once-a-month cooking, I was pregnant with our first child. We lived in a 250-sq ft studio apartment and were learning a lot about making the most of small storage space. How we fit three of us in that one room is a testimony to God’s grace and creative thinking. My freezer cooking experience was no different. Our refrigerator was the smallest they made that still had an independent freezer. It was one (small) step up from a dorm fridge. Yet, I was regularly able to store 30-40 meals in the freezer. Granted, I was only feeding two adults, but if we do the math, even that small freezer would hold 15 – 20 meals for a family of 4. Start with a mostly empty freezer. You are probably not going to be able to store several weeks’ worth of meals in your refrigerator/freezer if it already has multiple boxes of ice cream, loaves of bread, and packages of hamburger. Consider “eating from your pantry” so that you can reduce what is already there. If you have a stockpile of frozen meats and poultry, those are going to be the building blocks of your freezer meals. Research meals that you can make ahead using those proteins. You don’t need much extra space for these meals. You’re simply going to take the frozen hamburger out, thaw it, cook it up, give it a makeover and put it back where it was. Use freezer bags. Ziptop freezer bags, designed for cold temperatures and durability are able to hold many different kinds of frozen foods. These are especially useful for meats in marinades, taco fillings, pizza dough, and even thicker stews and chilis. 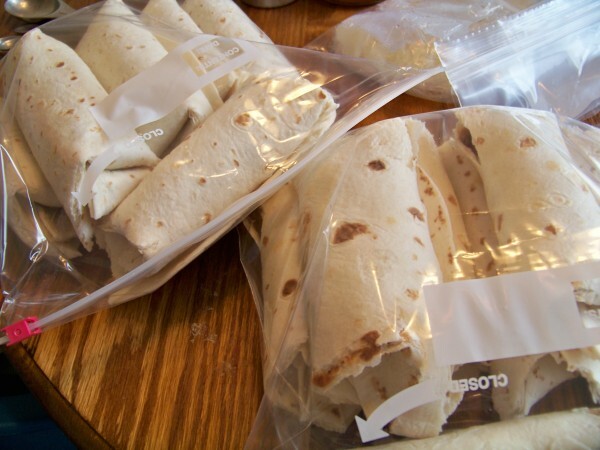 As you cool, label and freeze the food in these bags, seal them tightly and lay them flat in your freezer. Once they are frozen, you will be able to stand them on end and line them up like books on a shelf, making the best use of your storage space. Make sure that you remove as much excess air as possible to avoid freezer burn. Use like-shaped plastic containers. For more liquid meals, like pasta sauce, use containers that are all the same shape and size. These will stack the best and make the best use of your space. Square boxes are more efficient than round, but use what you have and look for other complements on sale in future months. Stack like with like. This is probably obvious, but bears repeating. If you have three 9×13 pans, stack those one on top of each other. Not only will those meals be easy to find, but you’ll make the most of your space. Consider freezing meals in components. You might not have room for 15-20 casseroles to fit in your freezer, but you don’t have to freeze it all together. You can freeze some meal components separately. For instance, when Crystal made my Slab Apple Pies, she froze each layer in a separate ziptop bag. This enabled her to have much more flexibility with her storage space; she could move the separate bags around and fit them where there was space, rather than have to find a way for a 9×13 pan to fit. You don’t have to have a free-standing freezer to make Freezer Cooking work for you. Sure, it helps. 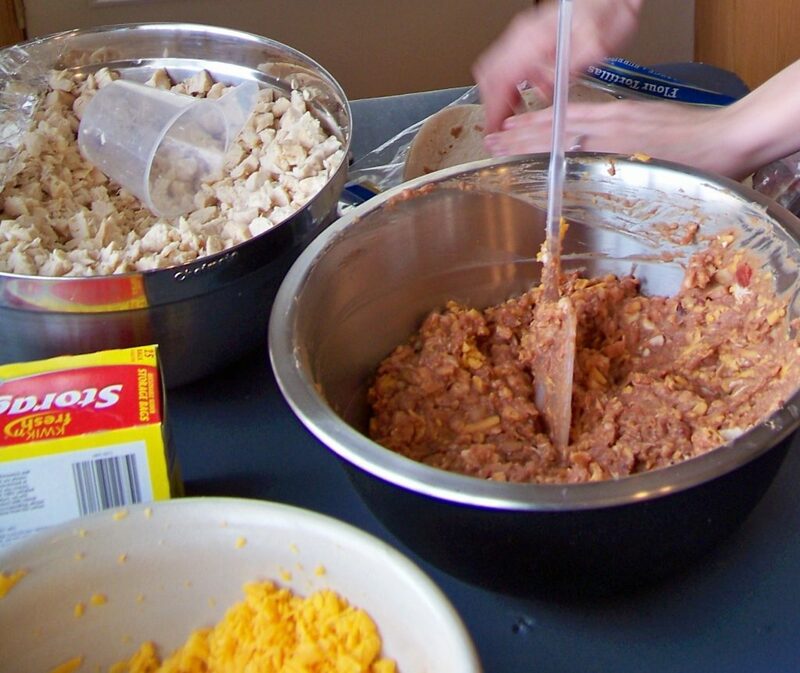 But, you can make the most of what you have and still enjoy homemade convenience foods. – Jessica Fisher, also known as FishMama, regularly feeds her freezer so that she can feed the hungry masses who call her “Mom.” She posts daily about life’s joys and challenges at LifeasMOM and shares delicious ways to act your wage at Good Cheap Eats.